The Romanov dynasty ruled Russia for over 300 years, from 1613 to 1917. It all ended in World War I and the revolution, and in brutal deaths in a secret basement, but we are still fascinated by their imperial splendor. 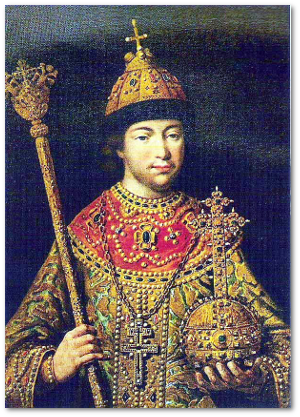 In 1613, the first Romanov tsar, Michael Fyodorovich, wore a pectoral cross, golden chain, and wide ceremonial collar to his coronation, as well as the regalia that have come down through the ages: the Crown of Monomakh and Boris Gudonov’s scepter and golden orb (Boris was the last tsar before the Romanovs and may have gotten these from a Late Rennaissance master in Western Europe). 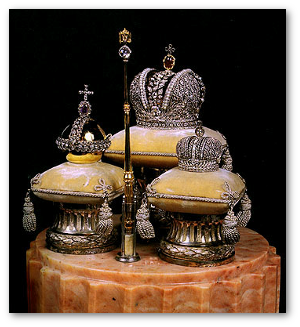 In the 1760s, Catherine the Great commissioned a new Imperial Crown, though the Crown of Monomakh is still among the crown jewels. The Smolensk Diamonds Jewellery Group recently used a mix of old and new techniques to make a replica of Catherine’s crown. They did it to mark the 50th anniversary of Russia’s diamond industry (which actually goes back a little more than 50 years), as well as the 400th anniversary of the founding of the Romanov dynasty and the 250th anniversary of Catherine the Great’s coronation. Unfortunately, no soundtrack is available for this fascinating video. 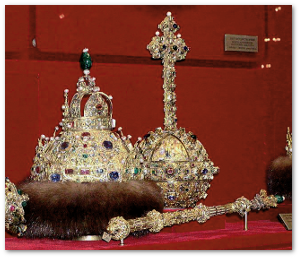 The Imperial Crown and the rest of the coronation regalia are only part of the Russian crown jewels. The Romanovs loved gold and precious gems. 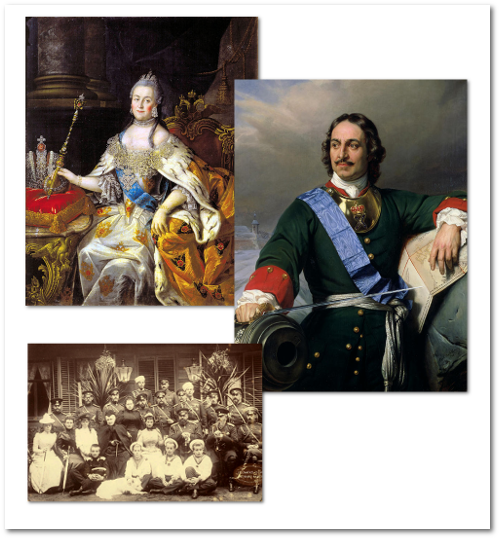 Some of their treasure collection is still around today, but only because Peter the Great decided that it should be shared with the country. 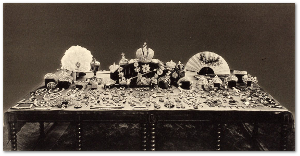 In 1719, Peter donated all the jewels used in the coronation ceremony as well as many pieces of 15th, 16th and 17th century jewelry to the state. He decreed that these should be protected and that all subsequent rulers must donate more jewels to the collection. … and returned to the USSR in 1950. Let’s take a look at some of the Romanov treasures that Peter the Great managed to preserve for history. The golden orb has four Biblical illustrations , as well as 58 diamonds, 89 rubies and tourmalines, 23 sapphires, 51 emeralds and 37 pearls. The scepter is also gold and decorated with one emerald, 20 diamonds and other precious stones. Its most notable diamond, the Orlov, is one of the Seven Great Stones in the Diamond Fund. The crown of Monomakh is made out of eight gold plates that are decorated with very fine gold filigree, inlaid with rubies, emeralds and pearls. It is trimmed with sable and topped by a gold cross decorated as pearls. It was used in the coronation ceremony for four centuries, from before the Romanovs through the 18th century, when Catherine the Great replaced it with the Russian Imperial Crown. Modeled on Western crowns, the Imperial Crown has a total of 4936 diamonds and many pearls. It also bears Catherine the Great’s “Ruby,” which is really a spinel – the second largest one in the world and another of Russia’s Seven Great Stones. By 1900, the Imperial regalia also included the Lesser Imperial Crown. 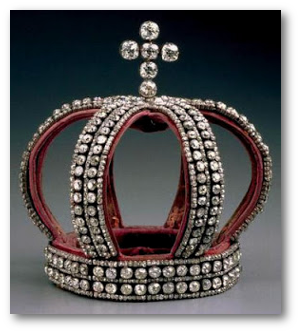 It was for the Empress and was similar to the great crown but smaller and covered only with diamonds. 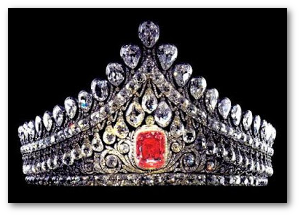 Catherine the Great’s red spinel, attached to the Imperial Crown of Russia, 398.72 carats. This comes from China in 1676. Like some other famous spinels, it was originally thought to be a ruby. Three beautiful gold nuggets – the Great Triangle, Mephisto and the Camel – are also part of the Russian crown jewels (source of images). The collection’s famous jewelry includes wedding paraphernalia like the Russian Nuptial Tiara and Nuptial Crown, as well as the Daffodil Bouquet (image source) and the Sapphire Fountain (image source). The Nuptial Tiara has many Indian and Brazilian diamonds set in silver and gold, most notably a 10-carat pink diamond, dating back to Tsar Paul I. The Nuptial Crown is smaller than the Tiara, but carries 1,520 diamonds, mounted in silver and set on a crimson velvet. There is much, much more in the Russian crown jewels. They are now part of the Russian Diamond Fund and are kept in the Kremlin Armory, on view for public tours. The Romanovs loved gold and jewelry, and they only settled for the best. The passionate the brave and the hapless. The people are gone now – victims of the passage of time as well as the changes and tragedies of human existence. Thanks to the foresight of Peter the Great, though, all of us can appreciate some outstanding treasures from their collections.